Saturday night’s match against St Kilda marks important landmarks in the careers of two Collingwood players. Josh Thomas has added an extra step to his run-up, diligently worked on his technique at training, and the result was a personal best five-goal haul against Carlton. 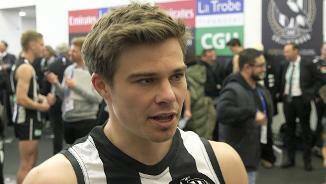 Collingwood midfielder Josh Thomas hopes to take his game to another level after graduating from Collingwood's rookie list. A hard-at-it midfielder who thrives on winning the contested ball, Thomas won early comparisons with 1991 Copeland Trophy winner Tony Francis courtesy of some promising performances at VFL level. Like Francis, he is a ball magnet and a tackling machine around the stoppages, and has a handy turn of speed over the first 15 metres. He was beset by an awful run with injuries in his first three years at the club but was able to finally illustrate his undoubted talent when his body allowed him to play 19 senior games in 2013. He made such an impression that he polled four Brownlow votes and earned the Harry Collier Trophy as Collingwood's best first-year player. The promising midfielder served a two-year league-imposed ban in 2015-16 for violating the AFL's drug code. He returned in a full capacity from his suspension in February, 2017 and played nine games in the second half of his comeback year. 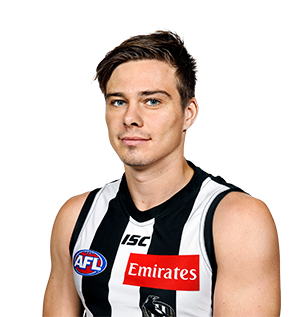 Returning from the exile of a two-year drug suspension, Thomas became the surprise package of Collingwood’s side in the back half of 2017. The 26-year-old had no business cracking into a star-heavy midfield group, yet managed to play nine straight games from round 15 to round 23. His return game against Hawthorn was the 33rd of his career and came 1,038 days after his most previous appearance in the Black and White. Thomas took little time to settle in. He had 21 disposals and was mobbed by teammates at the 18-minute-mark of the first quarter when he kicked Collingwood’s first goal of the afternoon. It was a consistent stretch of VFL form with led Thomas back into the big time. His ball-winning abilities were at their very best during a seven-match stint which included four performances among Collingwood’s best players. The Queenslander had 28, 30 and 31 disposals respectively in the early rounds to lead a midfield group largely consisting of younger faces. Thomas would return for a finals cameo in the VFL, however his best efforts couldn’t help the Magpies’ progress past the Elimination Final. Despite holding a place on the club's rookie list, Thomas spent the 2016 season suspended from all club activities after his ASADA-enforced ban for a positive test to the banned substance clenbuterol. He spent the year alongside fellow suspended teammate Lachlan Keeffe in Queensland before returning to the Holden Centre in December. Thomas was allowed to train with his teammates in a restricted manner as he prepared to return to Collingwood in 2017. In March, Thomas received a two-year ban from ASADA for testing positive to the banned substance clenbuterol. As part of the suspension, he was banned from any club activities and returned to his home state of Queensland to serve his suspension. 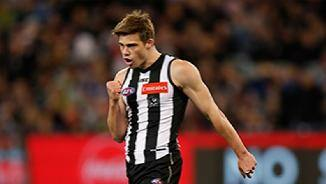 Thomas was delisted, but then placed on Collingwood’s rookie list in November’s Rookie Draft. He is expected to return to the club in December 2016. Injuries restricted Thomas in the early months of 2014, with a bout of knee tendonitis sustained in the lead up to Christmas preventing him from playing senior football until round four. He had previously demonstrated he was ready to roll with 22 disposals and nine clearances in the first round of the VFL season against North Ballarat, but was eased into the senior side’s campaign as the substitute against the Tigers. Thomas was again employed as the substitute on ANZAC Day and found himself squeezed out of the side a fortnight later. Solid performances in the VFL against Bendigo (28 disposals) and Geelong (24 disposals) saw him earn a recall to face St Kilda in round 11, when he put in one of the best displays of his career (29 disposals, three goals and five tackles) in an 86-point win. The 23-year-old held his place for the next six matches, but only twice won 20 or more disposals, meaning he returned to the VFL to meet Frankston in round 16. He won 32 disposals, laid nine tackles and won eight clearances in a 17-point loss to the Dolphins. Solid follow up performances against Box Hill and Essendon followed, only for Thomas to manage just three kicks in the come-from-behind win over Geelong in round 18. It didn’t stop him from earning a call up for the trip to Greater Western Sydney seven days later, when he turned on arguably the best match of his short career in the gutsy win over the Giants. In wet conditions and with just one fit man on the bench, Thomas won a team high 29 disposals to go with his eight tackles and three goals in an eight-point win. Good things come to those who wait. Just ask Josh Thomas. After three fruitless years marred by foot injuries, he could have been forgiven for thinking that the football life wasn’t for him. That all changed in 2013 when Thomas’ body remained sound and early season opportunities blossomed into a full-time role in the centre square. The 22-year-old’s campaign started in the green substitute’s vest in the NAB Cup against the Eagles but he caught the eye with 13 disposals and three clearances when he was released into the action. Another solid showing against the Lions meant that he was rewarded with a senior debut against North Melbourne in round one. He contributed 18 disposals and seven clearances to Collingwood’s 16-point win but was squeezed out of the side and played in only one of his side’s next four games. In that time he got his hands dirty at VFL level, never winning less than 24 possessions and peaking with 40 touches, nine clearances and four behinds against Bendigo. He was rewarded with a three-week patch in the seniors marked by his 28 possessions in the loss to Fremantle but again slipped back to the state league. After another commanding VFL performance against Essendon in round seven (24 possessions, six clearances, six inside 50s), the coaches could not ignore him any longer. Thomas was recalled for the trip to the Gabba in round 10 and the Queensland native made the best of his chance, winning 25 possessions and laying five tackles. He did not miss a game thereafter, growing in confidence as the season wore on. He began to make an impact on the scoreboard, kicking two goals on three separate occasions and receiving a Brownlow vote against Melbourne in round 11 (27 possessions and two goals) and three for his career-best display against the Eagles in the penultimate round (35 possessions, three tackles, four clearances). The return of Dayne Beams threatened to nudge him out of the side but strong performances against Gold Coast and Greater Western Sydney set him up for the run to September. Thomas’ dogged commitment to becoming a senior footballer saw him rewarded with the Harry Collier Trophy as Collingwood’s best first-year player. It may have been four years in the making but few would ever have been more deserving. The tough but injury-prone midfielder missed the first 15 rounds with stress fractures in his foot after suffering similar problems on the opposite side last year. Broke through for his first game in nearly a year in round 13 against Coburg in the VFL and played nine games. Was named as an emergency in rounds 22 and 23. Some luck and a full pre-season will hold him in good stead. Injury again blighted his season, missing the first half of the year with foot problems. Returned to the fray in round 14 against Box Hill and had an immediate impact around the stoppages (10 disposals, four tackles). Played the last six matches for the year and was named in the best in four of them. Hampered by a calf injury that kept him out of the first five rounds. Debuted for the VFL team in the round six win over Frankston at Frankston Oval. Played another 14 games, impressing in his role as a rover, and was named in the best in six matches. Originally from Redland, he spent 2009 playing for the Gold Coast U18s in the TAC Cup. Linked to Collingwood during the pre-draft speculation, and for once it proved accurate. The Magpies called his name with selection 75 at the National Draft. Had been offered a contract with Gold Coast ahead of their AFL introduction, scheduled for 2011, but declined. Averaged 19.5 disposals in his 10 games for the Suns in the TAC Cup.